Female Rhithrogena Mayfly Spinner View 9 PicturesI'm very tentatively (see the connected forum thread) sticking this mayfly in Rhithrogena for now. 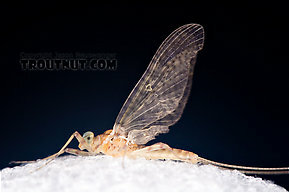 Female Maccaffertium terminatum Mayfly Spinner View 5 PicturesI was able to identify this female because I captured her while she was mating with an identifiable male. 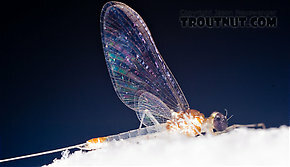 Male Maccaffertium terminatum Mayfly Spinner View 11 PicturesI positively identified this specimen under a microscope with a good key. 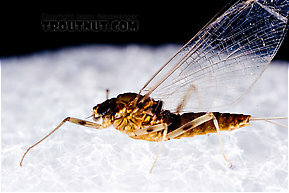 It was one of the more common species in a generally light mixed bag of mayflies over a big Catskill tailwater last night. 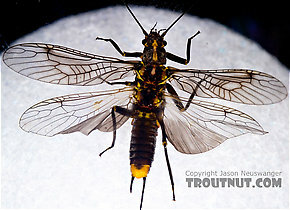 I swooped this one out of the air while it was mating with a female, so I can be certain about her ID as well. Male Maccaffertium ithaca (Light Cahill) Mayfly Dun View 6 PicturesBased on the identical size, shape, and relative proportions of different body parts, I'm pretty sure this dun is of the same species as two spinners I collected at about the same time. The color is dramatically different, but that's to be expected with many of these species in the transition from dun to spinner.